For related races, see 1964 United States elections. The 1964 United States presidential election was the 45th quadrennial American presidential election. It was held on Tuesday, November 3, 1964. Incumbent Democratic President Lyndon B. Johnson defeated Barry Goldwater, the Republican nominee. With 61.1% of the popular vote, Johnson won the largest share of the popular vote of any candidate since the largely uncontested 1820 election. Johnson took the office in November 1963 following the assassination of his predecessor, John F. Kennedy. He easily defeated a primary challenge by segregationist Governor George Wallace of Alabama to win nomination to a full term. At the 1964 Democratic National Convention, Johnson also won the nomination of his preferred running mate, Senator Hubert Humphrey of Minnesota. Senator Barry Goldwater of Arizona, a leader of his party's conservative faction, defeated moderate Governor Nelson Rockefeller of New York and Governor William Scranton of Pennsylvania at the 1964 Republican National Convention. 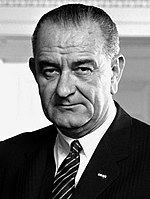 Johnson championed his passage of the Civil Rights Act of 1964, and his campaign advocated a series of anti-poverty programs collectively known as the Great Society. Goldwater espoused a low-tax, small government philosophy, and opposed the Civil Rights Act of 1964. Democrats successfully portrayed Goldwater as a dangerous extremist, most famously in the "Daisy" television advertisement. The Republican Party was badly divided between its moderate and conservative factions, with Rockefeller and other moderate party leaders refusing to campaign for Goldwater. Johnson led by wide margins in all opinion polls conducted during the campaign. Johnson carried 44 states and the District of Columbia, which voted for the first time in this election. Goldwater won his home state and swept the states of the Deep South, most of which had not voted for a Republican presidential candidate since the end of Reconstruction in 1877. Johnson's landslide victory coincided with the defeat of many conservative Republican Congressmen, and the subsequent 89th Congress would pass major legislation such as the Social Security Amendments of 1965 and the Voting Rights Act. Goldwater's unsuccessful bid significantly influenced the modern conservative movement and the long-time realignment within the Republican Party, which culminated in the 1980 presidential victory of Ronald Reagan. While on the first campaign stop of his re-election campaign, President Kennedy was assassinated on November 22, 1963 in Dallas, Texas. Supporters were shocked and saddened by the loss of the charismatic President, while opposition candidates were put in the awkward position of running against the policies of a slain political figure. During the following period of mourning, Republican leaders called for a political moratorium, so as not to appear disrespectful. As such, little politicking was done by the candidates of either major party until January 1964, when the primary season officially began. At the time, most political pundits saw Kennedy's assassination as leaving the nation politically unsettled. The only other candidate to actively campaign was then Alabama Governor George Wallace who ran in a number of northern primaries, though his candidacy was more to promote the philosophy of states' rights among a northern audience; while expecting some support from delegations in the South, Wallace was certain that he was not in contention for the Democratic nomination. Johnson received 1,106,999 votes in the primaries. At the national convention the integrated Mississippi Freedom Democratic Party (MFDP) claimed the seats for delegates for Mississippi, not on the grounds of the Party rules, but because the official Mississippi delegation had been elected by a white primary system. The national party's liberal leaders supported an even division of the seats between the two Mississippi delegations; Johnson was concerned that, while the regular Democrats of Mississippi would probably vote for Goldwater anyway, rejecting them would lose him the South. Eventually, Hubert Humphrey, Walter Reuther and the black civil rights leaders including Roy Wilkins, Martin Luther King Jr., and Bayard Rustin worked out a compromise: the MFDP took two seats; the regular Mississippi delegation was required to pledge to support the party ticket; and no future Democratic convention would accept a delegation chosen by a discriminatory poll. Joseph L. Rauh Jr., the MFDP's lawyer, initially refused this deal, but they eventually took their seats. Many white delegates from Mississippi and Alabama refused to sign any pledge, and left the convention; and many young civil rights workers were offended by any compromise. Johnson biographers Rowland Evans and Robert Novak claim that the MFDP fell under the influence of "black radicals" and rejected their seats. Johnson lost Louisiana, Alabama, Mississippi, Georgia and South Carolina. The Republican Party (GOP) was badly divided in 1964 between its conservative and moderate-liberal factions. Former Vice-President Richard Nixon, who had been beaten by Kennedy in the extremely close 1960 presidential election, decided not to run. Nixon, a moderate with ties to both wings of the GOP, had been able to unite the factions in 1960; in his absence the way was clear for the two factions to engage in an all-out political civil war for the nomination. Barry Goldwater, a Senator from Arizona, was the champion of the conservatives. The conservatives had historically been based in the American Midwest, but beginning in the 1950s they had been gaining in power in the South and West. The conservatives favored a low-tax, small federal government which supported individual rights and business interests and opposed social welfare programs. The conservatives also resented the dominance of the GOP's moderate wing, which was based in the Northeastern United States. Since 1940, the Eastern moderates had defeated conservative presidential candidates at the GOP's national conventions. The conservatives believed the Eastern moderates were little different from liberal Democrats in their philosophy and approach to government. Goldwater's chief opponent for the Republican nomination was Nelson Rockefeller, the Governor of New York and the longtime leader of the GOP's liberal-moderate faction. The vice-presidential nomination went to little-known Republican Party Chairman William E. Miller, a Representative from upstate New York. Goldwater stated that he chose Miller simply because "he drives [President] Johnson nuts". This would be the only Republican ticket between 1948 and 1976 that did not include Nixon. Although Goldwater had been successful in rallying conservatives, he was unable to broaden his base of support for the general election. Shortly before the Republican Convention, he had alienated moderate Republicans by his vote against the Civil Rights Act of 1964, which Johnson championed and signed into law. Goldwater said that he considered desegregation a states' rights issue, rather than a national policy, and believed the 1964 act to be unconstitutional. Goldwater's vote against the legislation helped cause African-Americans to overwhelmingly support Johnson. Goldwater had previously voted in favor of the 1957 and 1960 Civil Rights acts, but only after proposing "restrictive amendments" to them. Goldwater was famous for speaking "off-the-cuff" at times, and many of his former statements were given wide publicity by the Democrats. In the early 1960s, Goldwater had called the Eisenhower administration "a dime store New Deal", and the former president never fully forgave him or offered him his full support in the election. Shortly before the Republican convention, CBS reporter Daniel Schorr wrote from Germany that "It looks as though Senator Goldwater, if nominated, will be starting his campaign here in Bavaria, center of Germany's right wing." He noted that a prior Goldwater interview with the German magazine Der Spiegel was an "appeal to right-wing elements." However, the there was no ulterior motive for the trip; it was just a vacation. Johnson positioned himself as a moderate and succeeded in portraying Goldwater as an extremist. Goldwater had a habit of making blunt statements about war, nuclear weapons, and economics that could be turned against him. Most famously, the Johnson campaign broadcast a television commercial on September 7 dubbed the "Daisy Girl" ad, which featured a little girl picking petals from a daisy in a field, counting the petals, which then segues into a launch countdown and a nuclear explosion. The ads were in response to Goldwater's advocacy of "tactical" nuclear weapons use in Vietnam. Confessions of a Republican, another Johnson ad, features a monologue from a man who tells us that he had previously voted for Eisenhower and Nixon, but now worries about the "men with strange ideas", "weird groups" and "the head of the Ku Klux Klan" who were supporting Goldwater; he concludes that "either they're not Republicans, or I'm not". Voters increasingly viewed Goldwater as a right-wing fringe candidate. His slogan "In your heart, you know he's right" was successfully parodied by the Johnson campaign into "In your guts, you know he's nuts", or "In your heart, you know he might" (as in "he might push the nuclear button"), or even "In your heart, he's too far right". Some cynics wore buttons saying "Even Johnson is better than Goldwater!" The election was held on November 3, 1964. Johnson beat Goldwater in the general election, winning over 61% of the popular vote, the highest percentage since the popular vote first became widespread in 1824. In the end, Goldwater won only his native state of Arizona and five Deep South states—Louisiana, Mississippi, Georgia, Alabama and South Carolina—which had been increasingly alienated by Democratic civil rights policies. This was the best showing in the South for a GOP candidate since Reconstruction. The five Southern states that voted for Goldwater swung over dramatically to support him. For instance, in Mississippi, where Democrat Franklin D. Roosevelt had won 97% of the popular vote in 1936, Goldwater won 87% of the vote. Of these states, Louisiana had been the only state where a Republican had won even once since Reconstruction. Mississippi, Alabama and South Carolina had not voted Republican in any presidential election since Reconstruction, whilst Georgia had never voted Republican even during Reconstruction (thus making Goldwater the first Republican to ever carry Georgia). The 1964 election was a major transition point for the South, and an important step in the process by which the Democrats' former "Solid South" became a Republican bastion. Nonetheless, Johnson still managed to eke out a bare popular majority of 51–49% (6.307 to 5.993 million) in the eleven former Confederate states. Conversely, Johnson was the first Democrat ever to carry the state of Vermont in a Presidential election, and only the second Democrat, after Woodrow Wilson in 1912 when the Republican Party was divided, to carry Maine in the twentieth century. Maine and Vermont had been the only states that FDR had failed to carry during any of his four successful presidential bids. Of the 3,126 counties/districts/independent cities making returns, Johnson won in 2,275 (72.77%) while Goldwater carried 826 (26.42%). Unpledged Electors carried six counties in Alabama (0.19%). The Johnson campaign broke two American election records previously held by Franklin Roosevelt: the most number of Electoral College votes won by a major-party candidate running for the White House for the first time (with 486 to the 472 won by Roosevelt in 1932) and the largest share of the popular vote under the current Democratic/Republican competition (Roosevelt won 60.8% nationwide, Johnson 61.1%). This first-time electoral count was exceeded when Ronald Reagan won 489 votes in 1980. Johnson retains the highest percentage of the popular vote as of the 2016 election. Although Goldwater was decisively defeated, some political pundits and historians believe he laid the foundation for the conservative revolution to follow. Ronald Reagan's speech on Goldwater's behalf, grassroots organization, and the conservative takeover (although temporary in the 1960s) of the Republican party would all help to bring about the "Reagan Revolution" of the 1980s. Johnson went from his victory in the 1964 election to launch the Great Society program at home, signing the Voting Rights Act of 1965 and starting the War on Poverty. He also escalated the Vietnam War, which eroded his popularity. By 1968, Johnson's popularity had declined and the Democrats became so split over his candidacy that he withdrew as a candidate. Moreover, his support of civil rights for blacks helped split white union members and Southerners away from Franklin Roosevelt's Democratic New Deal Coalition, which would later lead to the phenomenon of the "Reagan Democrat". Of the 13 presidential elections that followed up to 2016, Democrats would win only five times, although in 7 of those elections, a majority, the Democratic candidate received the highest number of popular votes. The election also furthered the shift of the black voting electorate away from the Republican Party, a phenomenon which had begun with the New Deal. Since the 1964 election, Democratic presidential candidates have almost consistently won at least 80–90% of the black vote in each presidential election. This was the fourth and last time that the victorious candidate wasn't on the ballot in all states. Alabama refused to let Johnson on the ballot in this election and Truman in 1948. In 1892, Grover Cleveland was not on the ballot in Colorado, Idaho, Kansas, North Dakota, or Wyoming, while in 1860, Lincoln did not appear on the ballot in any future Confederate state except Virginia. The 1964 election was the last time to date that any of the following states voted for a Democrat: Alaska, Idaho, Kansas, Nebraska, North Dakota, Oklahoma, South Dakota, Utah and Wyoming, although in 2008 Barack Obama won one electoral vote from Nebraska's second congressional district. It is the only time in Alaska's history that the state has voted for a Democratic presidential candidate. This was the last time Virginia and Indiana voted Democrat until Obama won them in the 2008 election. California, Colorado, Illinois, Montana, Nevada, New Hampshire, New Jersey, New Mexico, and Vermont wouldn't vote Democratic again until 1992. Iowa and Oregon wouldn't be won by the Democrats until 1988. Arkansas, Delaware, Florida, Kentucky, Missouri, North Carolina, Ohio, Tennessee, and Wisconsin wouldn't vote Democrat again until 1976. In California, this election remains the last time to date when Calaveras, Colusa, Glenn, Inyo, Kern, Modoc and Tulare County were all carried by a Democratic presidential candidate. This is the last Presidential Election (as of 2016) that Arkansas and Louisiana voted for different candidates. ^ a b Weaver Jr., Warren (November 23, 1963). "Parties' Outlook for '64 Confused". The New York Times. p. 1. ^ Bigart, Homer (November 26, 1963). "GOP Leaders Ask Halt in Campaign". New York Times. p. 11. ^ "Jan 11, 1964: WALLACE CONSIDERS PRIMARIES IN NORTH". New York Times. Retrieved January 25, 2018. ^ a b c d e f Frum, David (2000). How We Got Here: The '70s. New York: Basic Books. pp. 58–59. ISBN 0-465-04195-7. ^ "Civil Rights Act of 1964 – CRA – Title VII – Equal Employment Opportunities – 42 US Code Chapter 21". Archived from the original on November 14, 2009. ^ a b Barnes, Bart (May 30, 1998). "Barry Goldwater, GOP Hero, Dies". The Washington Post. Retrieved November 6, 2016. ^ "The Living Room Candidate – Commercials – 1964 – Eastern Seabord". ^ "The Living Room Candidate – Commercials – 1964 – Social Security". ^ Black, Conrad (2007), p. 464. ^ Perlstein, Rick (2009). Before the Storm: Barry Goldwater and the Unmaking of the American Consensus. New York, NY: Nation Books. p. 375. ISBN 1568584121. ^ Nick Gillespie (July 30, 2006). "The Hard Right". New York Times. ^ Sally Satel (June 30, 2004). "Essay; The Perils of Putting National Leaders on the Couch". New York Times. ^ "' 64 Poll of Psychiatrists On Goldwater Defended". September 5, 1965. ^ "EXPERT CONDEMNS GOLDWATER POLL – Tells Libel Trial Magazine Survey Was 'Loaded' – Article – NYTimes.com". May 16, 1968. ^ "Goldwater Awarded $75,000 in Damages In His Suit for Libel". NYTimes.com. May 25, 1968. p. 1. ^ "The Living Room Candidate – Commercials – 1964 – Ike at Gettysburg". ^ "The Living Room Candidate – Commercials – 1964 – Peace Little Girl (Daisy)". ^ "The Living Room Candidate – Commercials – 1964 – Confessions of a Republican". ^ "Login to eResources, The University of Sydney Library". web.b.ebscohost.com.ezproxy1.library.usyd.edu.au. Retrieved 2018-08-14. ^ "Gallup Presidential Election Trial-Heat Trends, 1936–2008". gallup.com. Gallup, Inc. Retrieved 30 August 2012. ^ "1964 Presidential General Election Data – National". Retrieved March 18, 2013. ^ "Dave Leip's Atlas of U.S. Presidential Elections – Compare Data". ^ "Exit Polls – Election Results 2008". The New York Times. Davies, Gareth, and Julian E. Zelizer, eds. America at the Ballot Box: Elections and Political History (2015) pp. 184–95, role of liberalism. Donaldson, Gary (2003). Liberalism’s Last Hurrah: The Presidential Campaign of 1964. M. E. Sharpe. ISBN 0-7656-1119-8. This page was last edited on 14 April 2019, at 00:06 (UTC).